Mac Garageband song files can be afflicted by the dreaded 8 Bit Bug error, which can occur at random in audio files recorded using Garageband and stored within the Garageband song files. 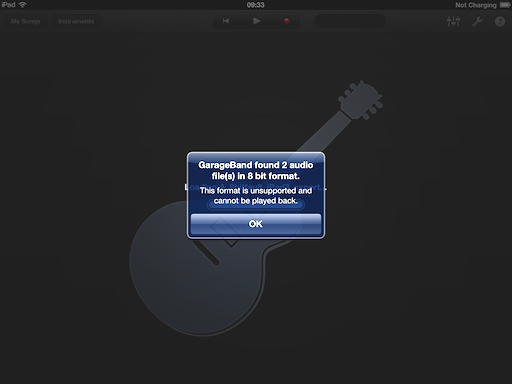 This 8 Bit bug is caused by faulty settings within the 'm4a' sample or effect media files within the Garageband song. The 8 bit error was brought to my attention by a user of my Garageband Mac To iPad + Mini iPad File Converter and the error messages and quite unequivocal as can be seen from the iPad screen dumps below. Always one for a challenge, I analysed a number of faulty songs for customers and have repaired many valuable large files, but editing the m4a sample or effect files is a random process at best, its also timing consuming and does not always produce an effective fix. After must experimentation I discovered that converting the original m4a files to WAV or AIF files would allow the song to be open and was an effective fix, of course the only real problem is that the song becomes substantially larger due to the uncompressed nature of the wav or aiff files over the smaller m4a. Having undertaken this tedious and repetitive manual conversion many times I decided to right a program to automatically fix the broken song file and to output a seperate folder of the m4a faulty files for the user to keep. It the generates a new folder and the old file is now fixed. That simple.